Feds Charge NSA Leaker With Spying, Theft : The Two-Way U.S. prosecutors have filed a criminal complaint against Edward Snowden, the former NSA contractor who is the source of a series of exposes published by The Guardian. A woman in Hong Kong walks past a banner displayed in support of Edward Snowden this week. The Washington Post reports that federal prosecutors have charged Edward Snowden — the former NSA contractor who leaked classified information on secret U.S. electronic surveillance operations — with espionage, theft and conversion of government property. 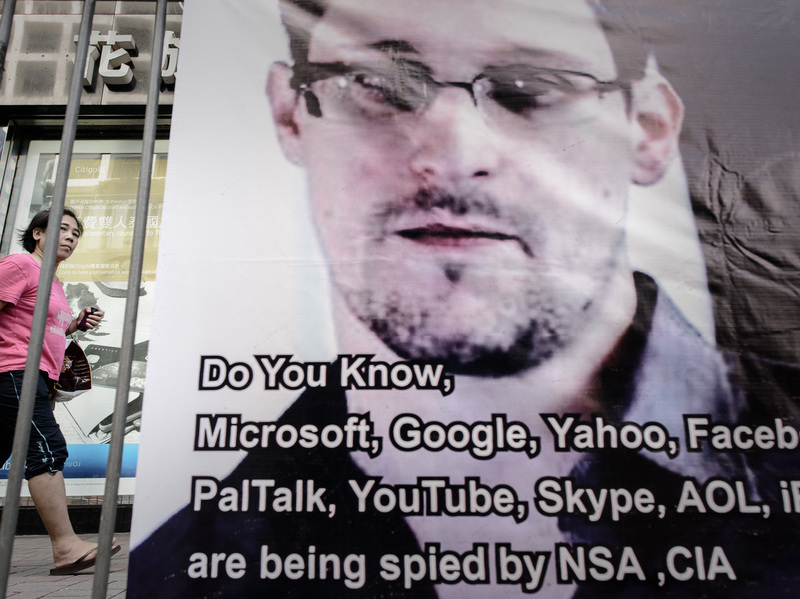 Three sources have told NPR's Carrie Johnson that a criminal complaint has been filed against Snowden, who is reported to be in hiding in Hong Kong after his identity was revealed by The Guardian newspaper last week. The complaint was filed Friday in the Eastern District of Virginia, where Snowden's former employer, Booz Allen Hamilton, is located. "There was never any doubt that the Justice Department would seek to prosecute Snowden for one of the most significant national security leaks in the country's history. The Obama administration has shown a particular propensity to go after leakers and has launched more investigations that any previous administration. "Justice Department officials had already said that a criminal investigation of Snowden was underway and was being run out of the FBI's Washington field office in conjunction with lawyers from the department's National Security Division. "By filing a criminal complaint, prosecutors have a legal basis to make the request of the authorities in Hong Kong. Prosecutors now have 60 days to file an indictment, probably also under seal, and can then move to have Snowden extradited from Hong Kong for trial in the United States. "Snowden, however, can fight the U.S. effort to have him extradited in the courts in Hong Kong. Any court battle is likely to reach Hong Kong's highest court and could last many months, lawyers in the United States and Hong Kong said." Update at 8:15 p.m. ET. Why Espionage? On All Things Considered, Carrie tells host Robert Siegel that charging Snowden under the Espionage Act is going to be controversial. "This is a World War I-era law that dates all the way back to 1917. The Obama administration has charged more individuals under this law than any other administration in history. And the law is not as flexible as it could or should be because it's so old. So it's quite clear there's gonna be a legal fight." "Attorney General Eric Holder has already been [under] fire on Capitol Hill for overly aggressive treatment of reporters, and he has said he does not want to criminalize the act of reporting." A U.S. government source tells Carrie there is "every indication" that Snowden is still in Hong Kong. The source tells her there is a history of cooperation between the U.S. and Hong Kong, but that authorities there "want to make sure every I is dotted and T is crossed before they do anything." Meanwhile, an Iceland businessman says he has a private plane ready to whisk Snowden away from his hideout.